I first heard that this would be a more action-oriented take on Sherlock Holmes, and naturally I worried that Holmes’s deductive skills wouldn’t be served and that the story itself would be more thriller than mystery. After watching the movie, I think it has enough to please both action and mystery fans. As with James Bond, there is a favorite portrayal of Holmes that will likely remain the favorite of many, but just as Daniel Craig made me forget all the Bonds before him in Casino Royale, for two-plus hours I was fully invested in Downey and Law as Holmes and Watson. The film opens with Holmes and Watson chasing down Lord Henry Blackwood (Strong), a serial killer and practitioner of black magic. Blackwood is hanged and pronounced dead, and our heroes move on. Watson announces his impending engagement, and Holmes sinks into boredom until Blackwood apparently rises from the grave. Holmes doesn’t believe a man can come back from the dead, but he has to prove how Blackwood tricked everyone. Meanwhile, the only woman to outwit Holmes, Irene Adler (McAdams) reappears working for a mysterious professor, looking for an associate of Blackwood’s. This film succeeds because Arthur Conan Doyle alluded to many dimensions of Holmes and Watson, only some of which he played out in his stories, and which others have shown onscreen. Law’s Watson is shown to compensate in areas Holmes is lacking. He is a full partner, not an amazed observer. 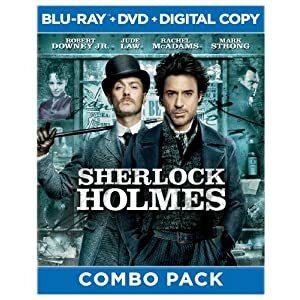 The film also succeeds because, despite any differences between Downey and the description of Holmes, you end up focusing on what Downey does with the character. I give this movie the highest praise I can give any movie: When it ended, I was ready for a sequel. This release includes one Blu-ray disc with the movie and special features and one DVD with digital copy. Special features include Maximum Movie Mode—a picture-in-picture commentary with Guy Ritchie and the makers of the movie. You can also play the focus points of this mode separately as short featurettes. Finally, there is a behind-the-scenes featurette, Sherlock Holmes: Reinvented.